A fire sprinkler pump is a part of a fire sprinkler system's water supply and powered by electric, diesel or steam. A fire pump's intake is either connected to the public underground water supply piping, or a static water source. Fire pumps start automatically when the pressure in the fire sprinkler system drops below a threshold. 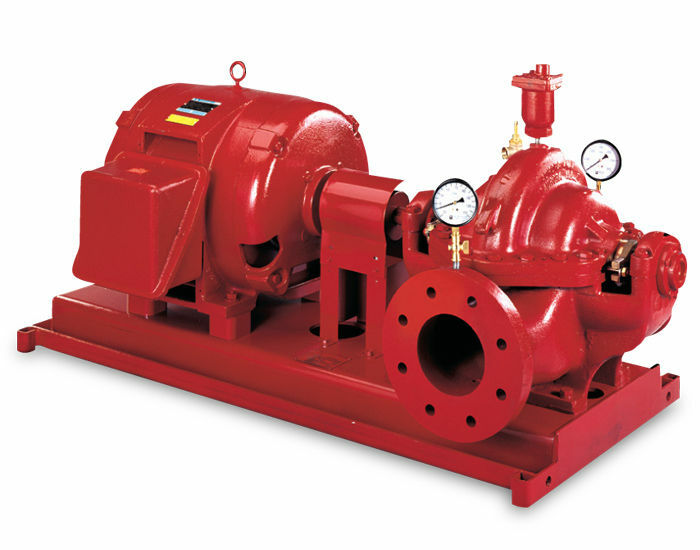 These specialized fire suppression pumps are needed when the local municipal water system cannot provide sufficient pressure to meet the hydraulic design requirements of the fire sprinkler system. This usually occurs if the building is very tall, such as in high-rise buildings, or in systems that require a relatively high terminal pressure at the fire sprinkler in order to provide a large volume of water, such as in storage warehouses. Fire sprinkler pumps are also needed if sprinkler water supply is provided from a ground level water storage tank.Types of pumps used for fire service include: horizontal split case, vertical split case, vertical inline, vertical turbine, and end suction. Call us today for specialized fire sprinkler booster pump expertise, service and repair of .